One of the many things a Sport Utility Vehicle is supposed to do is have the ability to leave the pavement. Yet, few ever actually do such a thing. Maybe touch the edge of the grass where the kids soccer fields are, but heaven forbid one would go any farther. Jeep has always defied that convention. From the battlefields of WW2 until today, Jeep has relied less on the “froufrou” and more on the sensible, and no-nonsense. It can indeed be driven on the road and off. The 2016 Wrangler Jeep sent me for a recent week is a fine example of that. 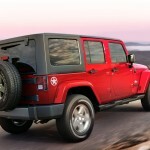 Besides the Willys, perhaps there is probably no more iconic Jeep in the lineup than the Wrangler. 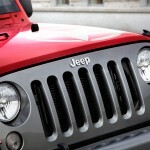 The Wrangler, once known as the CJ is actually a spinoff of the Willys. In a world of sedans, crossovers, minivans, and SUVs It has always been and remains in a class of its own. It’s a bit noisy, not too smooth on the road, and while you can remove the top, it’s a bit cumbersome to be called a true convertible. There’s no backup cameras, collision avoidance, lane keeping, no fancy adaptive cruise control. And in the end, none of that matters. Because what the Wrangler is, is brilliant. 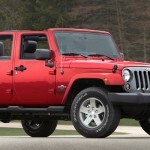 The Wrangler has two main configurations; two door and four door, called the Unlimited. 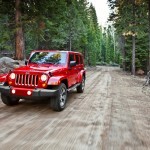 Whether two or four door, each has three trim levels ,Sport, Sahara and Rubicon. There are other special models based on those trims. A vinyl convertible roof is standard on both; there is a hardtop with removable panels above the front seats available (in the four door you can actually remove the rest of the roof as well, but you’ll need some tools). There isn’t a great deal of standard equipment on the Sport model. There’s cruise control, manual mirrors and door locks, steel doors with manual crank windows, cloth upholstery and 16-inch steel tires. 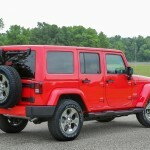 The tires are on and off road, and there’s a full size spare tire, tow hooks, skid plates and the doors are removable. The front windshield also folds down and there’s an eight-speaker sound system with a CD player and an auxiliary audio jack. The Unlimited Sport gets a bigger gas tank, and AC. The optional Power Convenience Group adds power windows and locks, keyless entry, heated power mirrors, a security alarm and an auto-dimming mirror. For the two door only, you can add the Sport S package which adds AC, and 17-inch steel wheels. Other options include, heated front seats, satellite radio, the Uconnect touch screen interface with a media player interface and a USB pot. Moving up to the Sahara, the “luxury” model of the line, the Power Convenience Group is standard, and there are automatic headlights, AC, insulation under the hood for a bit of sound deafening, a leather-wrapped steering wheel, 18-inch alloy wheels and satellite radio. The Unlimited Sahara adds tubular sides steps and rear grab handles for passengers, who on occasion may actually need to use them. The top of the line Rubicon is all about off road. There are the items from the Sport along with 32-inch wheels on 17-inch alloy wheels. 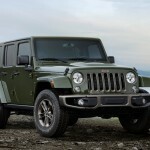 There’s a heavy duty front axle, an upgraded transfer case, electronic front and rear locking differentials, an electronically disconnecting front sway bar, rock rails, automatic headlamps and the under-hood insulation. 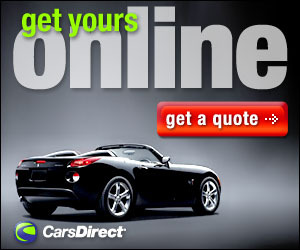 AC is standard, as is a leather-wrapped steering wheel and shift knob, a 115-volt outlet and satellite radio. 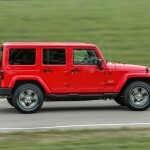 The Power Convenience Group is an option on the two-door Rubicon, but standard on the Rubicon Unlimited. 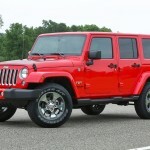 Standard, and for that matter the only, gasoline engine, is the Pentastar 3.6 liter V6 with 285 horsepower and 260 ft-lbs. torque ( diesel with a five speed automatic is optional across the line). A 6-speed manual is standard, a six-speed automatic can be had. The Command-Trac 4-wheeel drive system is standard, a heavier duty “Rock -Trac” with more torque is available. There are also a bunch of option packages available. Too many to list all here and a few special editions as well. My tester for the week was the Unlimited Sahara. As mentioned, on the road during my week, the Wrangler was a bit loud, needed constant attention to keep exactly straight; the steel doors rattled, had to be slammed to avoid a warning, and getting the two front panels off to open the roof took some effort. 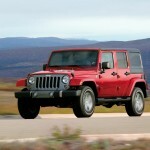 The Wrangler isn’t something you buy simply for getting from point A to point B. It’s all business. It reminded me of my grandfather who wore his truck driver’s uniform every day of the week, except Sunday, and then only because of church. 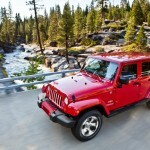 The Wrangler has a rich heritage. We should be glad it’s still around. In these modern times when our transportation has us almost cocooned, it’s nice to have a work horse ready to get the job done, and not afraid to get dirty doing it. 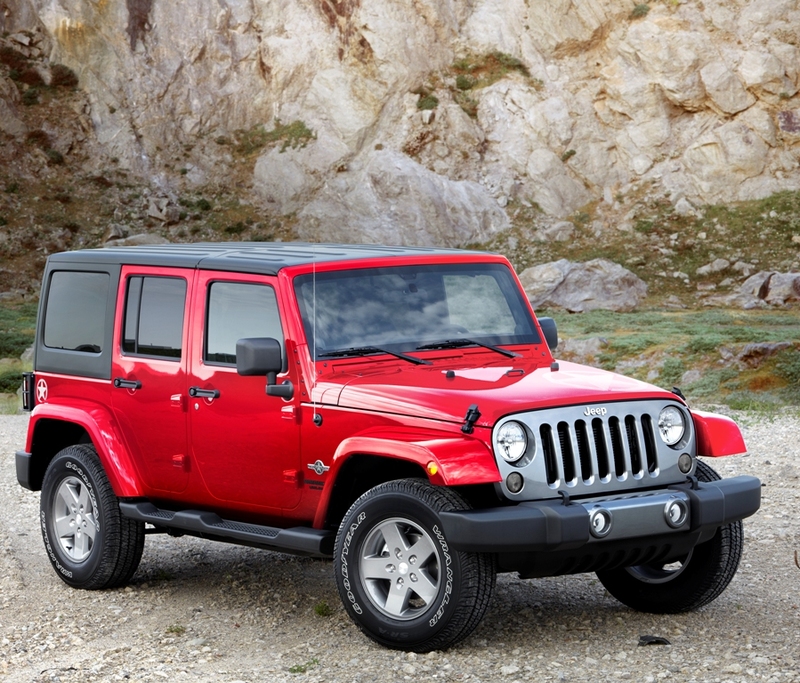 For the 2017 model year, the Wrangler will get a refresh. 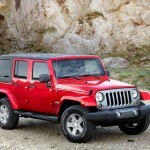 I hope they don’t do too much, because as it has been since it was introduced, the Jeep Wrangler is pretty close to prefect as it is. Rear Head Room: 40.4 In. Rear Hip Room: 56.7 In. Rear Shoulder Room: 56.8 In. Epa Interior Volume: 135.5 Cu.Ft. Maximum Payload (When Properly Equipped): 880 Lbs. Maximum Towing Capacity(When Properly Equipped): 3500 Lbs. Cargo Capacity, All Seats In Place: 31.5 Cu.Ft. Maximum Cargo Capacity: 70.6 Cu.Ft. Rust: 5 Yr./ 100000 Mi.